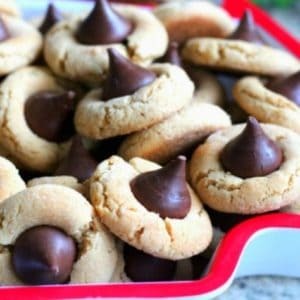 November 26, 2017 0 comments on "Hershey’s Kiss Cookies"
I love to try out new Christmas cookie recipes every year. This year I tried out a Kris Kringle cookie recipe. I will definitely be adding that recipe to my cookie recipe collection! Every year I also make sure to pull out my favorite old-fashioned cookie recipes, and these Hershey’s Kiss cookies certainly are an old time favorite. I have made them every Christmas for many years, and they are a family favorite. *Margarine can be used in the place of butter in this recipe, but you will be much happier with the taste and texture of the finished product if you use real butter! There is no better substitute when baking. Heat oven to 375 degrees. Beat the butter, sugar, brown sugar, peanut butter, and egg in a large mixing bowl until well mixed. Stir in flour, baking soda, and baking powder. Shape the dough into 1 inch balls. Roll the balls in sugar and placed on ungreased baking sheets, approximately 2 inches apart. Bake for approximately 8 minutes, or until the cookies just begin to turn golden brown. Remove cookies from oven and gently press a Hershey’s chocolate kiss into the center of each cookie. Carefully remove the cookies from the baking sheet and cool completely on waxed paper or wire baking racks . The chocolate will soften on the warm cookie and then harden up again after the cookie cools. These cookies are fun to make and taste amazing. They make a great addition to your holiday table and are great for holiday or Christmas cookie exchanges. These cookies freeze well, so if you are making them ahead of time, just place them in ziploc bags and place them in the freezer for up to 6 weeks. Like this recipe? You might also like my Hershey’s Syrup Copycat Recipe. Follow my Christmas board on Pinterest.